Quite a while ago, I wrote an article about the Great Pacific Garbage Patch, which ended up being included in a book entitled Opposing Viewpoints Series – Garbage & Recycling. While the magnitude of the problem is severely overstated in nearly every popular treatment of the subject, it is a real problem. It came about as a result of the fact that some of the plastic which is not disposed of properly ends up in the oceans. A lot of that plastic gets stuck in gyres – permanent circular currents that exist in distinct regions of the seas. In most cases, once the plastic gets stuck in the gyre, it doesn’t leave. So what happens to this plastic over time? Does it decay? Does it just float there forever? How badly is it affecting the ecosystem of the gyre? A new paper published in Environmental Science and Technology attempts to partially answer these questions. The authors sampled plastic marine debris (PMD), as well as the water in which it was floating, from several different spots in the North Atlantic. They then studied it with a scanning electron microscope (SEM), Raman spectroscopy, and DNA sequencing. The results were fascinating! The authors found a rich diversity of microscopic organisms living on the plastic.1 In fact, the diversity was so rich that they have decided the plastic supports its own little biological community. As a result, they call the plastic and the organisms living on it the Plastisphere. It’s probably correct to think of it this way, because the organisms living on the plastic are quite different from the ones living in the water where the plastic floats. Consider, for example, just the bacteria they found. Using all of the techniques listed above, they separated the bacteria into 2,518 2,815 different types, which they called Operational Taxonomic Units (OTUs). What this means is they didn’t identify exact species. They just grouped the bacteria according to similarity. Most likely, there are lots of species within each OTU. It turns out that 1,603 of these OTUs were found only in the water, while 1,026 of them were found only on the plastic. The plastic and water shared a mere 186 OTUs! In other words, most of the bacteria living on the plastic were quite different from the bacteria living in the water where the plastic was floating! The pits visualized in PMD surfaces conform to the shape of cells growing in the pits, and sequences of known hydrocarbon degraders support the possibility that some members of the Plastisphere community are hydrolyzing PMD and could accelerate physical degradation. In other words, when they looked at the microorganisms with the SEM, they found some of them sitting in pits that were shaped specifically to fit them. This indicates that the microorganisms “burrowed out” those pits themselves. Also, the DNA analysis indicated that some of the microorganisms were probably those known to decompose the chemicals that make up the plastic. It may be, then, that the ocean has a “clean-up crew” for plastic. This would make sense, since we know the oceans have a “clean-up crew” for oil. The majority of plastic pieces recovered in all net tows were fragments of less than 5 mm as has been reported in other studies. The majority of the plastic probably wasn’t in tiny pieces when it went into the ocean, so something must be tearing it down. The authors mention two other mechanisms of plastic degeneration that probably occur in the ocean, but the fact that the majority of the plastic in the ocean is in tiny bits seems to indicate a lot of degradation. Increases in PMD have been documented in the North Pacific Gyre, but despite increases in plastic production, use, and presumably input into the ocean, other studies show no significant trend in plastic accumulation in the North Atlantic Subtropical Gyre or in the waters from the British Isles to Iceland since the 1980s. They provide references to support these statements.2 The fact that plastic is not accumulating in most of the regions studied indicates that it is being disposed of better or there is an efficient plastic-degradation process active in the oceans. Most likely, it is a combination of the two. Despite this fact, it’s not all good news. Some of the types of bacteria found on the plastic are part of a genus that contains several disease-causing species. This particular study couldn’t identify which species of this genus were there, so the authors can’t say for sure. Nevertheless, they say their study indicates that plastic could be a means by which diseases among marine animals are spread. I hope a lot more research is done on the plastisphere because it is, unfortunately, a very real part of the modern oceans. H/T to Inazuma Lightning Flash for making me aware of the study! I remember reading your article about the oil spill in the gulf and thinking how AMAZING it is that God put different ways of dealing with problems into nature. Bacteria that deal with plastic? That’s so amazing. Plastic hasn’t even been around all that long. I love learning about these “new” discoveries. I can’t wait for more! Thanks for your comment, Kendall. God’s creation is amazing! It seems good news that the plastic waste is being destroyed. Are bacteria part if the food chain? If so, are there little creatures eating these bacteria and are they getting any nourishment from something that is lunching on plastic? Bacteria are definitely part of the food chain, Bill. They are generally eaten by protozoa, which then feed the larger plankton, which then feed the fishes, etc. Thus, there are probably some creatures that are essentially being fed (in part) by plastic. Thank you for the post! That was fascinating! When we get to know more about the bacteria which help decompose plastic, I wonder if it would be possible to ‘seed’ heavily contaminated areas with them in order to accelerate nature’s clean-up job? I would think that is possible, Enoch, but one always has to be careful when adding organisms to an ecosystem. 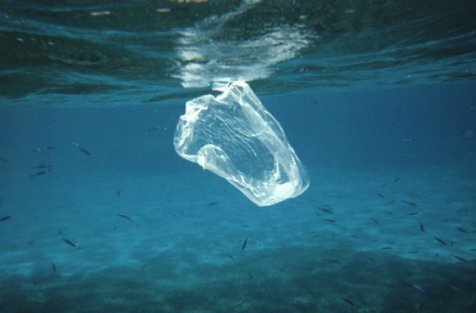 I would think lots of studies regarding what happens to those organisms once the plastic goes away would have to be done, because it is possible that a whole bunch of hydrocarbon-degraders with no plastic to eat might start degrading some hydrocarbons that are natural to the ocean and necessary for other organisms to survive. Wouldn’t this be evolution in action? Where did the bacterioa in the “plastisphere” come from? Could it be that they are bacteria from the oceans that evolved to the plastic found in there? It seems to me that evolution and natural selection played a role in creating this new environment. Luis, I don’t think you understand the results of the study. The authors didn’t find any novel genetic sequences or cellular structures in their analysis. Indeed, they could correlate their findings to organisms that already exist on earth. For example, they think that some of these organisms digest plastic because they found DNA sequences that are commonly found in previously-identified microorganisms that digest hydrocarbons. Now, of course, some adaptation might have gone on where mutations destroyed a regulatory gene or degraded a protein so that a natural hydrocarbon-digesting microorganism was able to digest plastic better. The ability for bacteria to mutate into being able to digest new food has already been seen in the lab, and it has been confirmed to be the result of a mutation that destroyed a regulatory sequence. Where did these microorganisms come from? The environment, of course. Most microorganisms are able to form spores that travel in the air. Other microorganisms actually live on dust particles floating in the air. Others that can’t survive in the ocean live on the organic debris floating on the ocean. When those spores (or organisms) encounter something that can viably support them, they proliferate. Thus, the microorganisms found on the plastic that were not found on the ocean simply encountered the plastic and proliferated there because it was a good environment for them. As a side note, I would like to point out that the story I linked above is an excellent example of evolution being used to make a prediction about an observation and Intelligent Design being used to make a different prediction about the same observation. When Lenski reported that he had raised some bacteria that could suddenly digest a new food source, evolutionists said it was because the bacteria were able to evolve a new gene. Intelligent-Design-scientist Michael Behe, however, predicted in a peer-reviewed paper that the ability came from the destruction of a regulatory sequence that already existed. As the link I gave in the first paragraph shows, the Intelligent Design prediction was eventually demonstrated to be correct, while the evolution prediction was demonstrated to be incorrect. I remember reading a science piece on the Lenski experiment thinking how dishonest this particular science reporter was. He never mentioned how this new ability was in fact the result of a “loss of information”. He was bragging of how clever evolution was. All I could think about was how this is the opposite of evolution. At least that was my understanding of it. I can certainly see why lay members of the public, myself included, could get confused over the issue. That’s the problem, Jason. Science reporters either lie or write from ignorance, and the public loses as a result. I enjoyed reading this article and thinking about its significance. Is it possible that there is a typo in the numbers in the paragraph about the OTUs? If the number 2518 were, instead, 2815, then the remaining figures in the paragraph would add up correctly: 1603 + 1026 + 186 = 2815. Thank you very much for pointing that out, Lois. You are correct, and I fixed it. I just read this article (which also links to a journal in the body of text) that is related to this one. It’s about a fungus found in the Amazon that eats plastic. Thanks for the link, Levi. I had no idea there is a fungus that digests plastic. I will get the scientific article and read what it has to say.